^ The Island of Palmas Case The Hague, 4 April 1928(パルマス島の判例） "If on the other hand the view is adopted that discovery does not create a definitive title of sovereignty, but only an “inchoate” title, such a title exists, it is true, without external manifestation. However, according to the view that has prevailed at any rate since the 19th century, an inchoate title of discovery must be completed within a reasonable period by the effective occupation of the region claimed to be discovered." ^ Legal Status of Eastern Greenland, PCIJ, April 5th, 1933（東グリーンランドの判例）"It is impossible to read the records of the decisions in cases as to territorial sovereignty without observing that in many cases the tribunal has been satisfied with very little in the way of the actual exercise of sovereign rights, provided that the other State could not make out a superior claim. This is particularly true in the case of claims to sovereignty over areas in thinly populated or unsettled countries." ^ THE MINQUIERS AND ECREHOS CASE "The Court does not, however, feel that it can draw from these considerations alone any definitive conclusion as to the sovereignty over the Ecrehos and the Minquiers, since this question must ultimately depend on the evidence which relates directly to the possession of these groups. ^ ヴァン・フリート特命報告書原文：The United States Government has consistently taken the position that the unilateral proclamation of sovereignty over the seas is illegal and that the fisheries dispute between Japan and Korea should be settled on the basis of a fisheries conservation agreement that would protect the interests of both countries. ^ PRINCIPLES OF PUBLIC INTERNATIONAL LAW by Ian Brownlie "The very considerable derogation of sovereignty involved in the assumption of powers of government by foreign states, without the consent of Germany, did not constitute a transfer of sovereignty. A similar case, recognized by the customary law for a very long time, is that of the belligerent occupation of enemy territory in time of war. The important features of 'sovereignty' in such cases are the continued existence of legal personality and the attribution of territory to that legal person and not to holders for the time being." ^ '竹島：「韓国領土」と免許取得HPに 米国オレゴン州' 毎日新聞, 2007-12-28. "米国オレゴン州が公式に開設している車の運転免許取得方法を記載したホームページの朝鮮語版に「独島（竹島）は韓国領土」などとハングルで記された車のイラストなどが掲載されていたことが分かった。日本の外務省は「竹島に関する不適切な表記」として州に遺憾の意を伝え、州は閲覧中止の措置にした。"
^ a b c 大韓帝国勅令第41号. - ウィキソース. (1900-10-25). ^ Hodgson, Robert David (1973). Islands: Normal and Special Circumstonces. Bureau of Intelligence and Research, U. S. Department of State. p. 189. ^ 土地分類基本調査 西郷. 島根県. (1980). p. 2. ^ a b c d e Shon, Y. K. and Park, K. H. (1994). “Geology and Evolution of Tok Island, Korea”. Journal of the Geological Society of Korea 30 (3): 242-261. ^ a b c d e f 이종범; 김재철 (6 2007). “울릉도와 독도 지역의 기후변화 추세와 그 요인”. 한국자연보호학회지 1: pp.19-28. ^ イギリス対フランス、判決1953年。 松井芳郎他「判例国際法」東信堂; 第2版 2006. ^ CASE CONCERNING SOVEREIGNTY OVER PULAU LIGITAN AND PULAU SIPADAN "The Court finally observes that it can only consider those acts as constituting a relevant display of authority which leave no doubt as to their specific reference to the islands in dispute as such." ^ United States Department of State (1976). Foreign relations of the United States, 1949. The Far East and Australasia (in two parts). Volume VII, Part 2. pp. pp. 898-900. http://digicoll.library.wisc.edu/cgi-bin/FRUS/FRUS-idx?type=turn&entity=FRUS.FRUS1949v07p2.p0312&id=FRUS.FRUS1949v07p2. ^ William T. Turner. 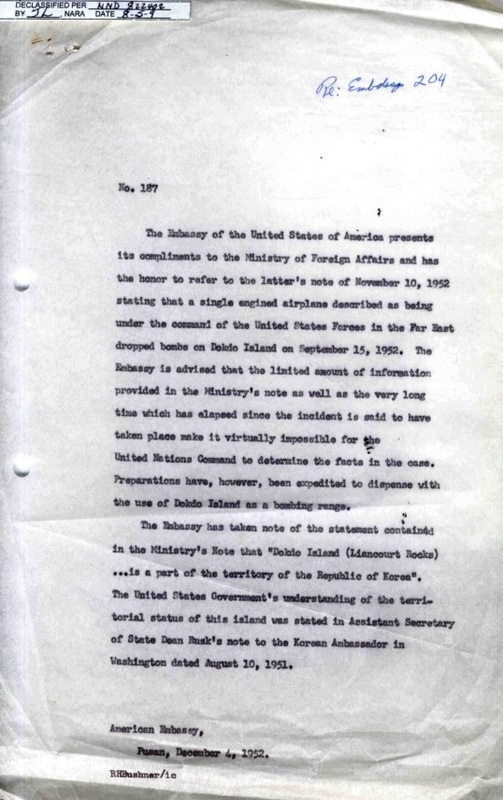 Memorandum in regard to the Liancourt Rocks (Takeshima Island) controversy. - ウィキソース. ^ Kenneth T. Young, Jr.. [[wikisource:Confidential Security Information about Liancourt Rocks |Confidential Security Information about Liancourt Rocks ]]. - ウィキソース. ^ Schieffer, J. Thomas (2006-04-20). The Ambassador and VFM Yachi discuss Liancourt. WikiLeaks. WikiLeaks cable: 06TOKYO2154. オリジナルの2011-09-17時点によるアーカイブ。. http://wikileaks.org/cable/2006/04/06TOKYO2154.html 2011年9月17日閲覧。. ^ Oregon Department of Motor Vehicles, Driver Manual (Korean version) Temporarily Unavailable, 2007-12-24. 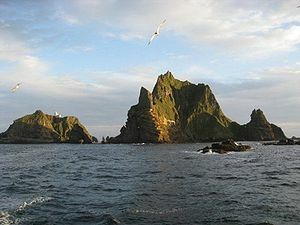 ^ Korean Petition Concerning Sovereignty of "Docksum", Ullungo Do, Tsuhima, and "Parang" Islands.